Looking for ways to use ground chicken? These highly rated meatballs have lots of flavor and can be used as appetizers or in meatball subs. They are great for the Super Bowl or other game day! Who can resist the buffalo chicken flavor? Great for casual entertaining or a family meal on a cold night. Make them small if you are using them as appetizers. Just put a small drinking glass filled with toothpicks nearby. Click here for link to the recipe at RachelRay. 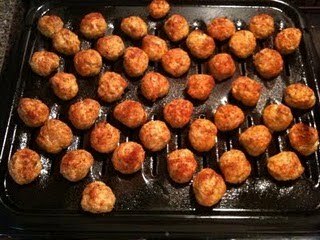 It’s a good basic recipe for chicken meatballs, so feel free to use your favorite chicken meatball recipe if you like. Toss the cooked meatballs in warmed hot sauce and then serve with toothpicks to dip in the blue cheese dressing that you bought. That is basically what Rachel did, though she did add 2 Tablespoons of butter to 1/2 cup of hot sauce. Works for me! I’m a big fan of chicken sausage that comes already spiced. It would make great meatballs without you having to mix in other things, though you could add some bread crumbs and an egg is you like. Chicken sausage often comes in links that you can cut open to get the meat out. Just form into meatballs, bake, and then roll in hot sauce, etc. Enjoy!